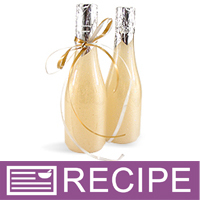 This sophisticated body wash resembles a champagne bottle, and would make an elegant favor for a bridal shower or wedding. It's packaged in a keuka bottle with foil wrapper on top to allow the packaging to look like champagne. The body wash itself is a golden shimmer that smells of bubbly champagne with additional notes of tangy grapefruit, grapes and plum. You Save $40.90 by purchasing this kit rather than buying the items separately. "Champagne Love But Chunky Gold"
COMMENTS: I love the smell and the champagne kits are amazing. Unlike the other pink champagne kit I ordered this one was a bit different. I'm not sure if it is due to being a bubble bath vs body wash but this one turned out that the gold got chunky but it turned out super cute anyway! COMMENTS: This kit is wonderful. Easy to make washes and they smell great. The only complaint is that there's not enough soap for all the bottles. Needs more soap or less bottles. COMMENTS: This was a perfect idea for a bridal shower party order. They loved it! COMMENTS: This kit is the kit to try. Easy instructions and not long to produce. One draw back only received 1oz of iridescent when I needed 3 oz to complete 1 gallon or 16 bottles. But Im sure that can be rectified. 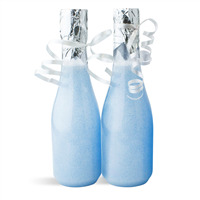 Weddings and celebration favors are brought to another level with these cute bottles and the Champagne kisses FO is so very very nice. COMMENTS: I'm new at this craft, but I've already discovered that I can depend on WSP for quality products. The Champagne Kisses Body Wash is top of the line. The smell is amazingly like champagne, and the packaging is the final touch. The wash itself foams into a rich, luxurious lather and makes me feel as if I've been treated to a spa. I highly recommend this product for ease of preparation, and I'm sure it will be a quick seller at my church's Christmas bazaar. COMMENTS: Just starting out here. Needed a "wow" product for a show. This is it. I added the WSP Pearlizer & Foamer at 3% and it came out great. The bottles hold 8 1/2 oz. to the ridge on the neck. • Kit came with one sample pack of mica. • Not enough mica for the directions. "I am doing this kit as a class. Is it safe to put the liquid suspension base in a crockpot on warm? Looking for a different alternative than the microwave." 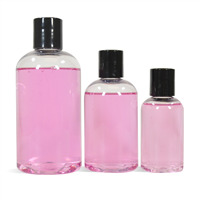 Staff Answer Hi Tara, yes, you can put the Liquid Suspension Soap base in the crockpot. Just make sure the soap doesn't go above the max. temperature of 120ºF. Heating above this can render the preservative inactive.